A surgical incision is an aperture into the body to permit the work of the planned operation to proceed. In cardiothoracic surgery, the routinely used incisions are the midline sternotomy, thoracotomy and pacemaker incisions. In this article, we shall look at the anatomy and clinical use of these common cardiothoracic incisions. The median sternotomy ① is the most common thoracic incision. It is predominately used for open heart surgery, such as valve replacements, CABG, or cardiac transplant. Anatomy – The incision is made from the substernal notch to around the xiphoid process, before cutting directly through the sternum to enter the thoracic cavity. Discussion – A widely used incision, which provides good access to the thoracic cavity and the mediastinum. It can predispose to significant scar formation and chronic chest pain. The pacemaker incision ② is utilised in the insertion of a pacemaker – a device that regulates the electrical activity of the heart. Typically, a 4-5cm incision is made in the left infraclavicular region. There are three main types of incision used – horizontal, oblique and deltopectoral. Once the incision is made, a subcutaneous ‘pocket‘ is created – in which the pacemaker is implanted. A thoracotomy is an incision used to access the pleural space of the thorax. 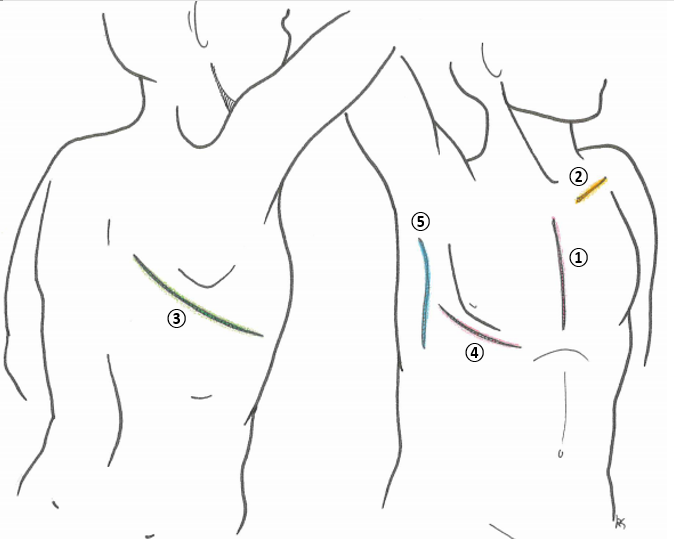 The three main subtypes are the posterolateral incision, anterolateral incision, and axillary incision. The posterolateral thoracotomy ③ is the gold standard for access to the thorax. It provides access all the thoracic viscera, and is mainly used for pulmonary resections (pneumonectomy or lobectomy), chest wall resection, or oesophageal surgery. The incision is made with the patient in the lateral decubitus position. It starts from between the scapula and mid-spinal line, and extends laterally to the anterior axillary line. Before reaching the thoracic cavity, the incision passes through the latissimus dorsi and serratus anterior muscles, then transects the rhomboids and trapezius. The anterolateral thoracotomy ④ incision can be used in a variety of operations for cardiac, pulmonary, and oesophageal pathology. The incision runs from the lateral border of the sternum to the mid-axillary line at the 4th or 5th intercostal space, dividing through the pectoralis major and serratus anterior in its approach. An axillary thoracotomy ⑤ is a muscle sparing approach to the thoracic cavity, used for pneumonectomy and pneumothorax operations. The incision is made between the posterior border of the pectoralis major and anterior border of latissimus dorsi muscles, through the 4th or 5th intercostal space. Whilst the incision reduces muscle damage and has good cosmetic outcomes, it has limited exposure to the thoracic viscera. Where is a pacemaker incision made? Which incision is the 'gold standard' for access to the thorax?